After having a quiet campus for about five days, I started missing students on my daily walk from Tanger House to the BEC. But then, I started counting down the days for their return and I am so glad to see the smiling faces of our students again - despite the cold and chill of winter which doesn’t want to go away. I can’t wait to hear about our students’ experiences from alternative spring break programs and I hope our faculty and staff also took a much needed break, if even for a day. Now, if only spring weather can arrive, we can start putting our winter jackets away. Let me share some exciting developments on campus. Around this time of the year, most administrators are engaged in putting finishing touches to the following year’s budget. On most campuses, increases in the cost of attendance is the norm. Well, guess what? This year MU will buck the trend by reducing the cost of attendance for our students (see below). Also, the Mentorship Task Force has submitted its report and our goal is to provide mentors for all our students, starting with this fall’s entering class. Other noteworthy events that are on the horizon are a celebration of 100 years of women’s athletics and a workshop on risk and safety. An update on our commitment to sustainability and inclusion is also included in this issue. Last but not least, I would also like to call to your attention to a new addition to our EPPIIC values webpage – a portal that allows members of our campus community to nominate programs or departments for recognition. It is important that we recognize exemplary accomplishments and continually highlight those areas of campus that are EPPIIC. Ogutu and Bennett’s vision from the onset was to have an on-going university R&D platform that prepared students in design thinking and engaged them in data collection. They wanted students to actually experience conducting surveys and doing interviews and to hear and see data of those living in the most complex of risk and safety environments. “The exciting part of the journey is that the research and processes developed are not only supporting students but are being introduced to industry,” explained Ogutu. “As students graduate and transition into industry they will be able to promote and introduce these new concepts.” On March 29, risk, safety and HR professionals will join forces and strategize with representatives from Flagger Force, PCC, Goodwill Keystone, Kinsley Construction and Lancaster General Hospital at this workshop. Over the last 100 years, Millersville has been at the forefront of athletics in Pennsylvania. It was also instrumental in the State System of Higher Education’s (PASSHE) plans to expand women's athletics. Women’s teams have won 21 of Millersville’s 48 Pennsylvania State Athletic Conference (PSAC) championships. It all began with women’s basketball in 1918. Intercollegiate competition began with a women’s basketball game against Shippensburg in 1921. Field hockey became a school favorite, and over the next 30 years the University acquired eight new women’s sports. A watershed moment came in the early 1980s when the PSAC, after almost 30 years of offering championships exclusively for men’s sports, began including women’s teams. Millersville made the jump from the Association for Intercollegiate Athletics for Women (AIAW) to NCAA Division II, which brought scholarships into the equation. I am excited to join the University community on March 30 as we officially celebrate the 100-year anniversary with a luncheon for alumni and friends of Millersville women’s sports. The event will include remarks from Marge Trout, who was originally hired to teach and coach both basketball and women’s lacrosse and would become women’s athletics greatest advocate. Also speaking will be 2010 graduate and now NBA official Ashley Moyer-Gleich, and 1974 graduate and member of the USA Field Hockey Hall of Fame, Linda Kreiser. The event begins at 11 a.m., and attendees are encouraged to attend softball, lacrosse and tennis competitions across campus in the afternoon. Online registration. My goal is to provide every student at Millersville University with the opportunity to work with a mentor. During the State of the University address in September last year, I charged our alums, all 65,000 plus, to engage with our students as mentors. 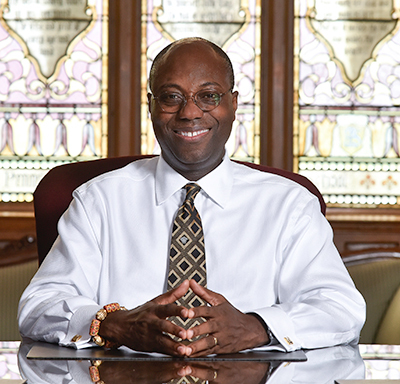 Last November, the Mentorship Task Force at Millersville University was created and I charged them with providing information and recommendations to help guide the development and implementation of the President’s Mentorship Initiative, which aims to coordinate, focus and amplify mentorship at MU for the benefit of all students. The task force, co-chaired by Dr. Brent Horton and Melissa Wardwell, recently turned in their report, which developed an inventory of our current mentoring programs, reviewed them for best practices and made recommendations. I want to thank the members of the task force for their hard work. In addition to Brent and Melissa, other members were Dr. Elizabeth Thyrum, faculty; Dwight Horsey, staff; alums John Held, Mike Henry and Dr. Saul Fink; along with student, Kaitlyn Bistline. The task force and I would like to acknowledge the dedicated efforts of our faculty and staff who are leading, or have led, mentoring programs on campus, and we are grateful to the many individuals who contributed information and insight over the last several weeks to assist the task force in its efforts. Affordability or cost of attendance is one of the major barriers for most students when it comes to attending college. As many of you know, I’ve been on a listening tour since last summer, meeting with faculty, staff, students, alums and the community. During my meetings with students, they shared wonderful stories about how they arrived on our campus and their incredible experiences here. However, I also heard concerns from them about our meal plans and the room cost in the residence halls. In an effort to provide greater flexibility, and as a result of what I heard from our students, we put together a plan to reduce the cost of room and board at Millersville University. At their meeting yesterday our Council of Trustees approved a plan that will decrease our fees, room and board charges by 3.3 percent, which will result in students paying $245 less per semester. Board (food) will decrease by 14.1 percent a semester, a savings of $345. Room (residence hall) charges will increase by 2 percent which is $76/semester. General fees will increase 2.2 percent, a $24/semester increase. We will expand dining options for students, faculty and staff, and expect demand to increase in response to our improved dining offerings. In addition, MU plans to extend dining hours at some locations to 1 a.m., an increase of four hours daily from the current 9 p.m. closing. Offering more service and extending the time are both positive steps to enhance the student experience. One year after opening its doors, our most sustainable building, the Lombardo Welcome Center, has met its goal in producing more energy than it uses. Millersville will apply for its official zero-energy certification from the Living Future Institute in May. The Lombardo Welcome Center opened its doors in February 2018, exactly one year after contractors broke ground in February 2017. After a few months of calibration, Sustainability Director Chris Steuer began tracking the building’s energy consumption and production. From May 2018 through February 2019, the center consumed 89,782 kWh and it produced an impressive 166,904 kWh. The center set its record for most energy generated in a single day on May 24, 2018 at 1,483 kWh. This building harnesses the energy of the sun and the earth. A total of 528 solar panels on the roof generate electricity, 20 geothermal wells drilled 400 feet into the ground heat and cool the building, and several rain gardens treat storm water on-site. An additional 20 solar panels are located on the ground array behind the building so visitors and MU students can view the technology up close. Additionally, solar glass from Spain is located on the south side of the building that also generates electricity as well as radiant floor heating in the lobby—known as the Steinman Foundation Atrium— which improves comfort and saves energy. LED light fixtures used throughout the building also reduce energy usage. The Lombardo Welcome Center became an Environmental Protection Agency (EPA) Green Power Partner in December. This designation was a key factor in the University earning a Climate Leadership Award from Second Nature in 2019. Millersville University contains a student body that continually exemplifies awareness and acceptance of students of all kinds. In the past few years, a major project led by the student body has been the “Disability Film Festival.” This festival offers several movie options that reflect the true and honest realities of living with all types of disabilities. The most recent film shown, on March 7, was “Concerning Barriers,” a series of three movies that expand on all aspects of this lifestyle including accessibility and social response. Because Millersville has a wide variety of students on our campus from different backgrounds, such an event is a perfect way to educate ourselves and create new respect in our community. This event aims to allow our student body to see and understand the people surrounding us who experience day-to-day life slightly differently than others and help bring everyone together as a community. A large step that needs to be taken to create a tight-knit, respectful student body is learning and understanding different people and their lives on and off campus. Most of our students strive to be as inclusive as possible, and this event is just one of many that we will employ to become closer as a campus. Coming up on April 15, we will have another chance to educate ourselves when Millersville holds “Disability Pride Day.” It will include a ribbon cutting ceremony to celebrate the removal of a turnstile in the Galley for a more accessible alternative. I hope everyone had a relaxing and refreshing spring break. Some of our faculty and students were quite busy during the week. Dr. Duane Hagelgans took a group of 12 students to Texas. 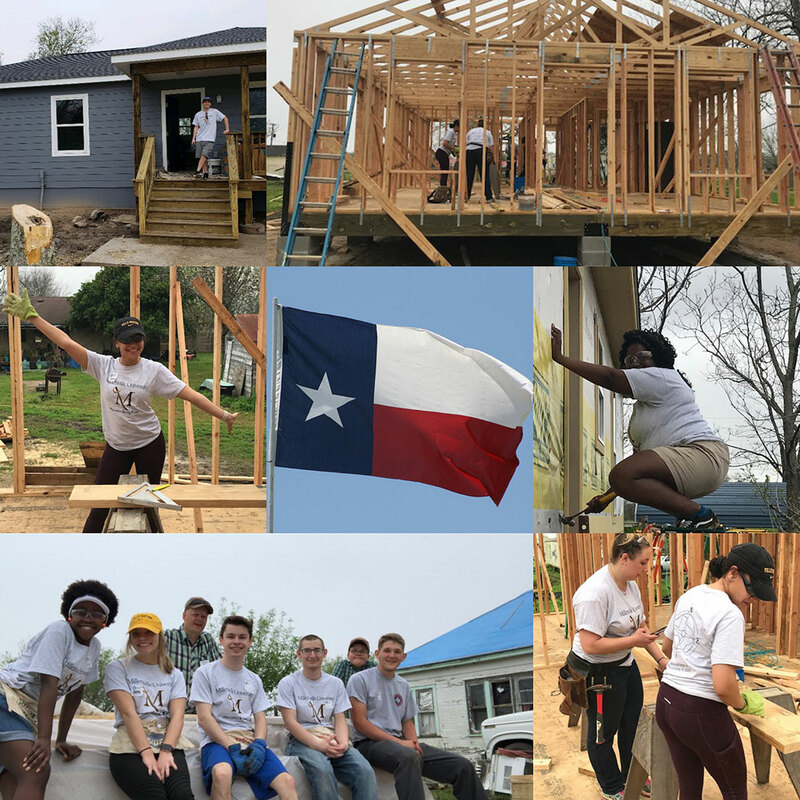 They were part of a service learning trip through Mennonite Disaster Service and spent the time rebuilding and repairing homes in Bloomington, Texas. They saw firsthand the devastation that remains from when Hurricane Harvey hit the area in 2017. Students trained as they went - laying new roofing and installing siding. 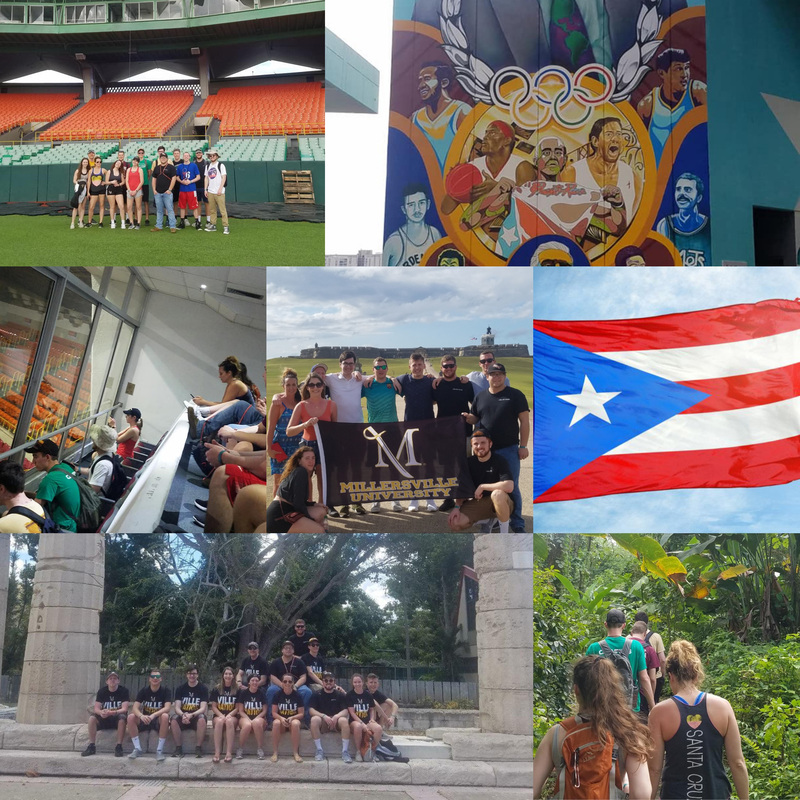 Meanwhile, Dr. Dan Keefer, professor and chair of our Wellness and Sport Sciences department, took students to Puerto Rico to visit sports venues and learn about athletics there.